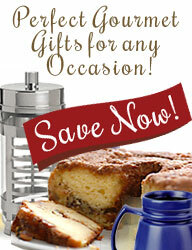 "My friend gave me the cranberry coffee cake as a gift and I absolutely loved it." Large chunks of New England's most famous berry naturally sweetened with pure New England maple syrup. Walnuts are mixed into the traditional rich sour cream coffee cake batter. Festive and delicious this holiday coffeecake is now available all year long. The one-pound twelve-ounce coffee cake serves approximately 10 - 12 and can be frozen up to four months. Kosher Certified and contains no trans fats, artificial flavoring, artificial coloring or preservatives!